You’ve always dreamed of having a gazebo in your garden area or back yard, but maybe you assumed that the upkeep on a gazebo would just be too much of a hassle. Enter the modern option: the vinyl gazebo! Alan's Factory Outlet vinyl gazebo gives you a maintenance free gazebo. The good news is that vinyl lasts practically forever and is super easy to clean. Even better, vinyl gazebos from Alan’s Factory Outlet are just as attractive as the traditional styles. A vinyl or PVC gazebo from Alan’s is available in a variety of designs as well as custom options. You’ll be the envy of the neighborhood when you invite everyone for a picnic in your beautiful and hassle free PVC gazebo. You’ll be able to tell them that vinyl gazebos are a terrific investment to enhance the outdoor living space of your home. 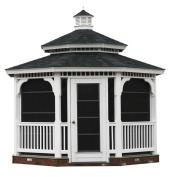 You’ll find one of the largest selections of vinyl gazebos for sale at Alan’s Factory Outlet. 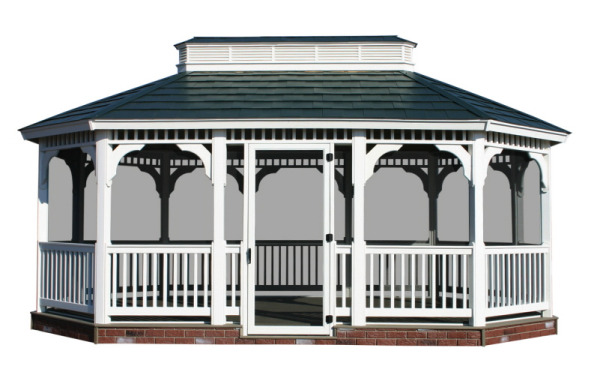 Our vinyl gazebos are custom built with a single roof or double roof, depending on your preference. The available shapes for our vinyl gazebo include Octagon, Oval or Rectangle gazebos. No matter what type of vinyl gazebo you’re looking for, we’ll help you find something that meets your needs. At Alan’s Factory Outlet, our gazebos are available with many options, such as screens to help keep those bugs out. Our vinyl gazebos for sale also come with the option of 4 Track Windows for year round usage. You will also have your choice of either a brick or white vinyl base on each Gazebo. 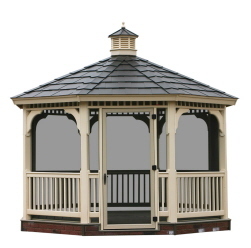 A cupola is a standard feature on all of our Octagon and Oval Gazebos. Vinyl PVC Gazebos are now standard with a 1"x8" Pine tongue and groove boards under the asphalt shingles. Vinyl gazebos also have a stained interior. Our Virginia, West Virginia, and Maryland neighbors who are looking for vinyl gazebos will be happy to hear that we offer free delivery to 21 local counties in VA and WV our vinyl gazebo. We can offer delivery of your vinyl gazebo to any location in Virginia, including the Shenandoah Valley. We also deliver to Northern Virginia, Central Virginia and Southern Virginia for any outdoor vinyl gazebo order. Our vinyl gazebos also come in gazebo kits, for customers who need or want to assemble their gazebos themselves. A gazebo kit can be delivered right to your curb and only needs a day or two to assemble. 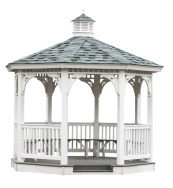 Gazebo kits are available in a wood gazebo kit and vinyl gazebo kit. Why consider vinyl gazebos for sale anywhere else when you can get a great deal on a long-lasting vinyl gazebo, wood gazebo kit, or vinyl gazebo kit right here at Alan’s? Call us today at 1-800-488-6903 for more information on a custom vinyl or PVC gazebo for your own garden or back yard!